Discover the Grand Parc by bike thanks to bicycle paths from Lyon. On foot or by bike, the Grand Parc is awaiting you. Trips beside the lake or in wild environment; choose the itinerary that looks like you. Go on the educational paths of the islands with a nature guide, another way to discover the Grand Parc with family or friends. Come and test our brand new electric bikes for hire in the Grand Parc. No more difficult climbs or excuses not to get into sports, you will love your sports outings! Explore and admire the nooks and crannies of the park in complete autonomy and in optimal comfort. From now on, the joys of great escapades are finally accessible to all ! These strolls are done cycling. Make sure you have appropriate equipment: sportswear, helmet and keep hydrated, especially children. 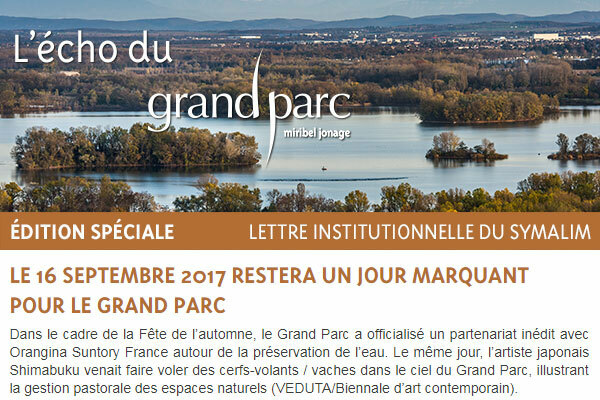 First trip to discover the Grand Parc, from the Grand Parc reception, take north direction cycling along the driving range of the Grand Parc. A detour toward Le Morlet beach is possible to enjoy services on the spot. Le circuit VTT bifurque sur votre gauche pour pénétrer dans le secteur du "Grand Morlet". Vous disposez sur votre chemin d'un point d'eau potable et de tables pour pique-niquer. The trip turns left to go into Grand Morlet area. Drinkable water and picnic tables are on your way. Then the trip goes back to the reception and follows the former lône (old Rhône arm) during 1 kilometre. Finally, you will find again the initial trip which takes you to the right of the reception and to the car park. This is a wooded trip which will show you the north part of the Grand Parc. From the reception of the Grand Parc, take the north direction cycling along the driving range of the Grand Parc. You arrive in the Morlet area with its beach and its summer restaurant. Cross the ford and turn left. You enter into the Sablettes area where you will find a second restaurant. Cross the viaduct of the A42 motorway to discover Rhône arms and Miribel Canal. You are in the north and wooded part of the Grand Parc, next in the wood, where you will see bridleways. This path brings you then until the Gravier Isard car park. Then you go onto a new area with the lake of la Droite and 2 art works: Stations and Fountain of Love (Drapeau panoramic viewpoint). You follow the cove of the Lézards before finally reaching the car park. This is a panoramic trip offering a constant view on the lake of the Eaux Bleues. From the reception of the Grand Parc, take the north direction cycling along the driving range of the Grand Parc. You arrive in the Morlet area with its beach and its summer restaurant. Cross the ford and turn right. You successively cross the Baraka area, the Castor play area and the Mama area where you could admire the cove of the Lézards and the peninsula of the Grands Brotteaux. You keep going straight towards the lake of the Pêcheurs and the lake of the Drapeau at the same place that the safety point K. The trip keeps going into the Grands Vernes area (break at the panoramic viewpoint and the vantage point of the peninsula). The trip finishes in L’atol’ going through the Fontanil area (Pyracorde play area). This is a nature trip that discover unknown areas of the Grand Parc. From the reception of the Grand Parc, take the north direction cycling along the driving range of the Grand Parc. You arrive in the Morlet area with its beach and its summer restaurant. Cross the ford and turn right. You successively cross the Baraka area, the Castor play area and the Mama area where you could admire the cove of the Lézards and the peninsula of the Grands Brotteaux. You keep going straight towards the lake of the Pêcheurs and the lake of the Drapeau at the same place that the safety point H; you turn left to reach the Gravier Isard car park. From this car park, turn right following the trip n°4 and turn left. You can see agricultural lands of the Grand Parc on your left. At the junction with the Vieux-Rhône path, turn left to cycle towards the lake of the Forestière. The trip crosses other agricultural lands and head towards the Rizan car park. Then, go on your left to reach the Jonage Canal and the spillway just before the Herbens Bridge. Then follow the Martel path to discover L’îloz’ (Allivoz gardens). Straight ahead, the trip reaches the small Camargue near the lake of the Allivoz and the lake of the Bletta. Finally you reach the reception of the Grand Parc going through the Fontanil area where you will enjoy the Pyracorde play area. This is the largest trip of the Grant Parc and a daylong ride with your family. From the reception of the Grand Parc, take the north direction cycling along the driving range of the Grand Parc. You arrive in the Morlet area with its beach and its summer restaurant. Cross the ford and turn left. From this car park, take the Apron path which follows the Miribel Canal. Then, turn left. You see the downstream Thil breach (used for clipping), and then you turn right to reach the Brotteau du Sablon path. Go along the second cow pen towards the Trou Rond. Then the trip goes to the Plançon farm, the last building at the east of the Grand Parc. You cycle down towards the south by the Plançon path and you follow the model aircraft fields next to the Violettes ((former farm on the road to renovation). Then the trip goes towards the lake of Emprunt where you can have a break. Now the trip goes through a swamp area called Rizan to reach the same named car park. Then you keep going straight towards the lake of the Île Paul, then the lake, the farm and the educational garden of the Allivoz. Straight ahead, the trip reaches the small CamarFinally you reach the reception of the Grand Parc going through the Fontanil area where you will enjoy the Pyracorde play area.